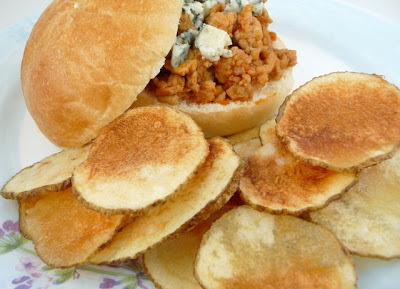 As I alluded to in my Buffalo Chicken Sloppy Joe post – I served that sandwich with some ‘homemade’ potato chips. These chips are truly revolutionary – they are made in the microwave, they are super simple to make and they taste fantastic. It is truly unbelievable! You would have no idea that they are not deep fried. Definitely so much healthier then any other way of making potato chips! 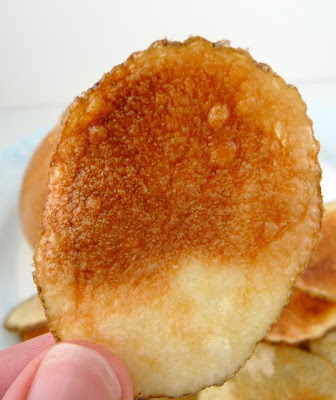 It never even occurred to me to even attempt to make my own chips until I saw this recipe. I was definitely intrigued and since I had some russet potatoes – it was worth a shot trying. I’ve already made them again – they are that good. You must try these! 2. In a bowl, toss the potatoes with olive and sprinkle on salt or seasoning. 3. Arrange the potatoes in a single layer on a microwave safe plate. 4. Working in batches, microwave the potatoes on high for 5-7 minutes [depending on the power of your microwave]. Keep a close eye on the potatoes, since they can burn if cooked for too long. The finished potato chip should be golden brown and crisp. 5. Carefully transfer to a serving dish and let rest for 2 minutes until cool enough to eat. More salt or seasoning can be added as soon as they are removed from the microwave. these are really good. Christine was hesitant about making them. I remember I walked into the kitchen and started snacking and thought "mmm... these are good" to which Christine replied "they are from the microwave!" Never tried to microwave potato chips before. Looks good and easy. Thanks for sharing. I am going to try these this week! I have a big bag of potatoes to use up and these would be great!